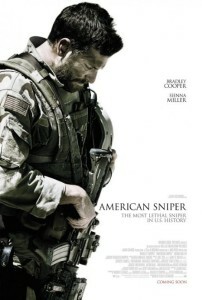 Clint Eastwood’s rendition of American Sniper, starring Bradley Cooper and Sienna Miller, is the amazingly true story about sacrifice, patriotism, and how psychologically damaging war is. Adapted from the memoirs of Chris Kyle, the most accomplished marksman in the history of the United States military, Eastwood delivers a movie which will be regarded as one of the greatest war stories of all time. If you do not feel moved once the film as ended then maybe you were not paying close enough attention. Although under the guise of a war film, Eastwood really is laying out an uplifting thriller that follows the life and the strain on the personal relationships of Chris Kyle. The film follows Kyle growing up in Odessa, Texas, to joining the SEALs, to his four tours of Iraq where he amounted at least 160 confirmed kills and had a six-figure bounty placed on his head, as well as the instability of returning home. This is the story about a man that, although he loved his family, could not stand the thought that people were dying whilst he was sitting safe and comfortable in his own home. And Bradley Cooper delivers it perfectly. Cooper has bulked himself up to the size of a tank for the role and the mix of dead-eyes and emotion is impressive to behold. Whilst everyone else cheers at his kills, Cooper stonewalls them, acting as if the kill doesn’t matter. It’s throughout the film that, although he draws more away from his family, he draws closer to the audience as the effects of war gradually start to take their toll on the man, and Cooper delivers this brilliantly. The R&R scenes seem more action packed than the actual battle scenes due to the toll that the tours have had on Kyle’s brain and Cooper seems to be acting to a high standard, even when he’s not having to do anything. This is the best performance of Cooper’s career. If anything bad could be said about the film, it would have to be the editing. The changes between scenes are too quickly sliced and chopped and, were it not for the title cards, it would be hard to know were one scene ended and another began. Although the film is appropriately titled American Sniper, the cinematic lens is too focused in on Cooper and blurs out the rest of the cast and some of the action. The best scene in the film would have to be the shootout toward the end where the principle role of our hero is flipped on its head. Instead of being positioned far away from the violence and viewing the opposition as ‘savages’ with no value to their lives, Cooper is now pitted in the fight and is being shot at. Does the way in which the film is shot vary? No it does not and this is why Eastwood is at the top. After a few terrible outings, Eastwood is back to his directorial best at the levels of Flags of Our Fathers or Letters from Iwo Jima. American Sniper is the film that Chris Kyle deserves and will draw awareness to the people that are out there, putting their lives on hold, so that the rest of us can sleep safely at night. Tagged 4/5, Action, Adventure, Biography, Drama, Film, Review, War. Bookmark the permalink.